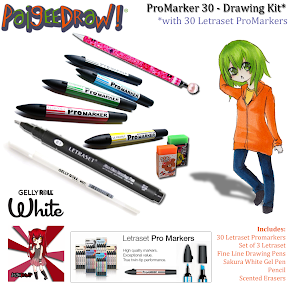 Paige Rohrick of PaigeeDraw is pleased to announce the lastest PaigeeDraw Manga Drawing Contest - PaigeeDraw Olympics 2012! For a number of months, Paige Rohrick of PaigeeDraw asked the PaigeeDraw Community Members what they would like to see for the PaigeeDraw Olympics Contest! The contest theme, characters, and prizes were all discussed. Paige has put together the Olympics Contest from the hundreds of emails she received! The theme of our new contest is "PaigeeDraw Olympics!". The PaigeeDraw characters and you are going to the Olympics in London! They may be going to watch the games, sight see or even participate. It is up to you to decide. Draw your favorite PaigeeDraw Character taking in the sights of London, cheering for their favorite athlete or team, or participating in a sport. The characters should be dressed in an Olympics themed outfit (country flag, olympic gear, or something representing London). Your favorite PaigeeDraw, ChibiDraw or PaigeeDraw Boys Character! Nyan, Aoi, Haru, Mai, Kuru, Tsubasa,Trent, Kuya, to name a few. A Character representation of yourself - it wont be as fun if you are not there! A Flag for the country you are cheering for or a British flag. The location of the drawing can be at an Olympic event, in an Olympic Stadium, at a place in London (Big Ben, London Eye, Buckingham Palace, Westminster Abbey, Tower Bridge, St. Pauls Cathedral, Trafalgar Square, Piccadilly Circus, Abbey Road, etc.). Have fun, this rule is to give you some ideas or inspiration! Your favorite athlete or team. A Manga Page telling a story. There are a total of 5 Prizes to be awarded: Prizes are different for each age category. You must use the CONTEST CODE or Order Number to qualify for the "PRO" Prizes. The PaigeeDraw contest is open to everyone in the world! 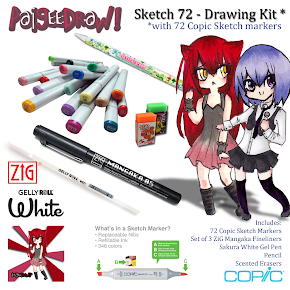 PaigeeDraw offers a larger prize for individuals that support the PaigeeDraw Community by either their purchase of a PaigeeDraw Product on iTunes, or by supporting the online store. It is this support that allows us to continue offering contests and great prizes! Please support PaigeeDraw by purchasing your art supplies at our store, or by purchasing a PRO copy of PaigeeDraw. Note: I added a category a NEW category for 8 and under because I really, really like the drawings from this age group, and it is hard for them to compete with the older artists. At least 1 PaigeeDraw / ChibiDraw or PaigeeDraw Boys characters must be included: ie. Nyan, Aoi, Mai, Haru, etc. The character must be clearly recognizable as a PaigeeDraw character. Full Characters or Chibis can be used. A hand drawn PaigeeDraw Olympics Logo must be included on every drawing submitted. You can use the existing PaigeeDraw Olympics Logo or create your own. If the logo is not included, your drawing will NOT be included in the contest. Elements: The elements covered in the contest theme must be included on each drawing submitted. 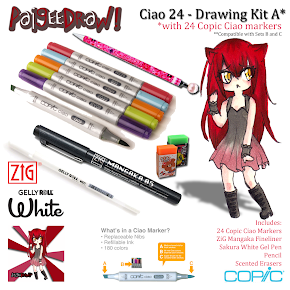 *Compatible with PaigeeDraw Ciao 24 Set B and C (No Duplicate Markers). This kit has everything you need to get started! Grow your kit by adding Sets B and C! 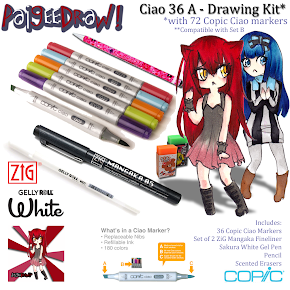 *Compatible with PaigeeDraw Ciao 24 Set A and C (No Duplicate Markers). This kit has everything you need to get started! Grow your kit by adding Sets A and C! 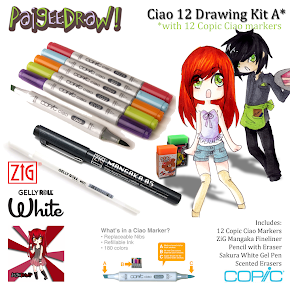 *Compatible with PaigeeDraw Ciao 24 Set A and B (No Duplicate Markers). Alternate First Place Prize - All Ages if Contest code is not submitted. **All submitted drawings may be featured on any of the PaigeeDraw Sites, including the PaigeeDraw World, PaigeeDraw, ChibiDraw and PaigeeDraw Boys facebook page - all entry details will be included with the drawing. 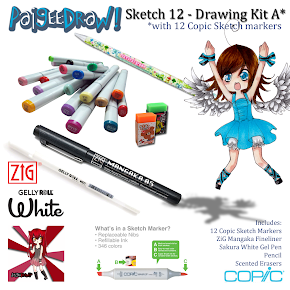 All submitted drawings may be featured on the PaigeeDraw Web Site, PaigeeDraw Blog, PaigeeDraw Online Store, or the any of the PaigeeDraw Applications including PaigeeDraw, ChibiDraw, PaigeeDraw Christmas and PaigeeDraw Boys. Looking forward to everyone's PaigeeDraw Olympics 2012 Entries!